Gun rights advocates have long argued that silencers are a safety device since they reduce the noise associated with firing many firearms from a level that is damaging to the shooter's hearing to a level that, while not actually silent, is far safer. They believe that easier access to and wider adoption of the devices could reduce firearm-related hearing damage, especially for those who commonly hunt without hearing protection. Advocates often compare firearms silencers to car mufflers since Hiram Percy Maxim had a hand in creating both and they both utilize the same technology. "This legislation will enable gun owners to have better access to hearing protection products and improve safety for the shooting sports by removing extensive wait times for burdensome paperwork processing that does not advance public safety," said Lawrence Keane, senior vice president at the National Shooting Sports Foundation. "NSSF is appreciative of Sen. Crapo's leadership on this firearms safety issue and his willingness to stand alongside lawful American gun owners, hunters, and shooting sports enthusiasts." "Many gun owners and sportsmen suffer severe hearing loss after years of shooting, and yet the tool necessary to reduce such loss is onerously regulated and taxed. It doesn't make any sense," said Chris W. Cox, executive director of the National Rifle Association's lobbying arm. "The Duncan-Carter Hearing Protection Act would allow people easier access to suppressors, which would help them to better protect their hearing." 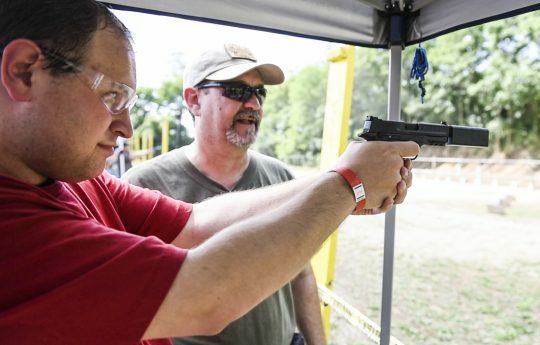 Sources within those leading gun groups put the Hearing Protection Act, along with Rep. Richard Hudson's (R., N.C.) National Reciprocity bill, among the top priorities for the gun rights movement under Presidenet-elect Donald Trump's administration. Activists have publicly expressed excitement at the prospects for silencer reform in the aftermath of the election.